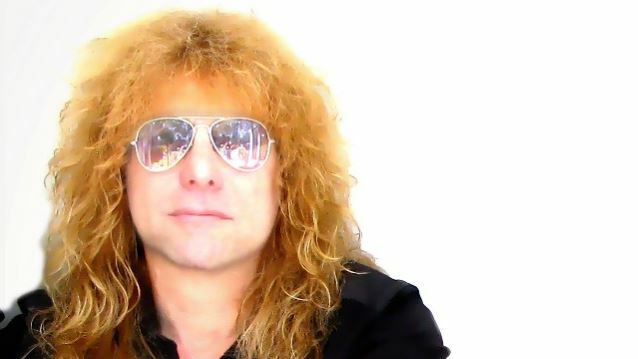 During an appearance on the March 2 edition of Eddie Trunk's SiriusXM satellite radio show, "Eddie Trunk Live", original GUNS N' ROSES drummer Steven Adler was about how he would feel about a hypothetical reunion of the classic GN'R lineup which would include Matt Sorum on drums instead of him. "Matt wouldn't do it," Adler insisted. "I see Matt practically every Monday night, and we talked about it. He wouldn't do it unless I was a part of it. And I said, 'Well, dude, I would do it without you.' And he said, 'But you're the original guy. You're the sound of GN'R. I'm not. So it's different.' And I said, 'If I did it, if Axl [Rose, vocals] wanted to play the '[Use Your] Illusion' songs, I would have you right next to me. You come up and I'll either take the throne or sit where I sit. '… Sort of like [the way we did it] at the Rock And Roll Hall Of Fame [induction in 2012]. They didn't show that part on TV, I don't think, but [Matt] played 'Brownstone', and then I came up and played 'Sweet Child' and 'Paradise City'." Adler continued: "But, yeah, I have nothing against Matt. He didn't do nothing. I had resentments with him, but I talked with him and I worked everything out. Everything. I would love to share a tour bus with him." Steven also spoke in more detail about his desire to see the original GUNS N' ROSES lineup reunite for a new album and tour. He said: "The whole reunion thing I would love to do just because of two decades of new fans who have never seen what the magic was. And I would love to be able to show them, but that's Axl's call." He continued: "I just keep hearing that [Axl] has this thing with [guitarist] Slash. I hope not. 'Cause it's too old already. Time goes on. We're too old. We've gotta move on. If he has resentments… I hope he doesn't. That’s all. I love him, and I love all those guys. Let's leave it at that. [Laughs]"
Asked about the fact that Slash recently tweeted a "Happy Birthday" message to Axl, Adler said: "I think that's great. 'Cause he doesn't have nothing against Axl. He loves Axl too. The four of us all love Axl. And I know that. 'Cause we had something that was so magical and so special, and nobody can ever take that away. And no matter what anybody did to anybody… time's supposed to heal all wounds. Let's move on. Let's all be happy and do what we love doing. And if we have an opportunity to play for the whole world and let everybody love it… 'Cause that's every musician's dream: to play music that everybody loves. And we did that. And I said, 'Let's take advantage of it and show the world…' I mean, personally, myself, I wanna show everybody how appreciative I am that they love our music. 'Cause I love a wonderful life. Well, finally… but a wonderful life because of them. I get to do what I like to do, and that's play music." Adler continued: "It's been a wasted 25 years that the magic between Slash and Axl hasn't been together and making music for the world. I mean, that's like Mick Jagger and Keith Richards, Robert Plant [and] Jimmy Page, Steven Tyler and Joe Perry. And it's a shame that Axl and Slash weren't making music together, 'cause they were born to make music together. Slash is great by himself, Axl is great by himself, but together they are frickin' amazing, and nothing could stop them." Steven also spoke about the last time he saw and spoke to Rose. He said: "It was in Las Vegas, I think, [in] 2006. [GUNS N' ROSES] was playing at the Hard Rock, and I went down. And then his partner, Del James, saw me in the audience, in the back, and said, 'You'd better leave. I don't want Axl getting pissed.' I left, I went home, I was walking in the front door and my phone's ringing. I pick it up, and it's Del. And he says, 'I'm so sorry. Axl wanted to talk with you.' So I went back. And we drank a three-thousand bottle of tequila, and we hugged, and we made our amends to each other, and it was wonderful… It was just me and him sitting at the bar with a bottle of tequila, doing shots and just talking. It was really nice. So I love him." Steven Adler was the drummer for GUNS N' ROSES from 1985 to 1990. He was eventually fired from the band due to his drug addiction, which caused him to spiral down into depression and more drug use. GUNS N' ROSES was inducted into the Rock And Roll Hall Of Fame in April 2012. Adler, Slash and bassist Duff McKagan attended the ceremony, while Rose and founding guitarist Izzy Stradlin stayed home.